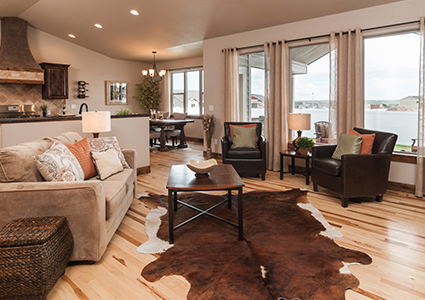 A beautiful living room floor plan with expansive windows, designed for GB Builders in Cheyenne, WY. King Engineering is a full-service structural engineering, architectural drafting, building information modeling (BIM), and construction services firm devoted to providing our clients with the best quality work. Since establishing in 2007, we have become a highly sought after design and engineering consultant in the Rocky Mountain region as well as other locations across the country. We have provided services on over a thousand residential, commercial, religious, governmental, and industrial projects for owners, contractors, architects, engineers, developers, realtors and lenders, and we look forward to many more years of continuing to build our reputation for excellence. We have a strong focus on sustainable design offering services on a wide variety of project and construction types, but those with a demand for energy efficiency, wise selection of building materials, and long-term sustainability have become our bread basket. Because of this commitment, King Engineering has become a well-established design firm in the region for designing with insulating concrete forms (ICF), structural insulated panels (SIP), sustainably harvested and recycled wood products, frost-protected shallow foundations (FPSF), and passive solar principles. We strive to make certain that every building we create is not only structurally sound and a pleasing work or living environment, but that when the opportunity arises, the project leaves as small of a negative footprint as possible. When called upon, we take pride in how we can guide our clients through every aspect of the building process, from conceptual design through completed construction. We believe that the best way to be certain of a great result is through continuous and active collaboration with our clients. We start with your vision for what you need to build and work with you every step of the way to ensure that the final product is the best possible outcome given sometimes very conflicting variables. You can see the final results of this process in our completed projects throughout many diversified areas. Our goal is to help clients through the process of constructing a home or building that they can be proud of. If you are dreaming of creating a new home, building or other structure, make an appointment with us to talk it through. We would appreciate an opportunity to substantiate our claims of excellence and expert service!